Today was our first day of the road trip proper - we packed up the car in the morning and got on the highway. We weren't on the highway long before we were hungry for lunch - welcome to Hitoyoshi. The town has castle ruins next to the river and the cherry blossoms were in full bloom - instant Hanami! We had lunch and met a bunch of very friendly locals who shared their lunch with us. Apparently in 1185 the Heike fugitives were defeated in the battle of Dannoura and they came here to hide. They started making toys similar to what they had in Kyoto and started a long line of type makers. We visited a Folk Craft center showing traditional toys and traditional arts. The center also has "you make it" areas - pottery, paper making, ring making and demonstrations were available on different days. The museum section showed toys and crafts from different time periods. In general, the boys toys (kits, models) were much more fun than the girls toys - dolls. Many of the toys seemed impossibly delicate - pretty much only for display. One of my favorite parts were the water nymphs - apparently these are traditional figures that said to be tricksters. They will take things from you unless you bow to them - when they return the bow, the water runs off their heads and they have to return to the river immediately. Our goal for the evening was a camp site at Ebino Kogen - a small area near the top of the volcano in that national park. Eric had booked us in a cabin. The camp provided blankets and a Kotetsu - a table with a heater under it. 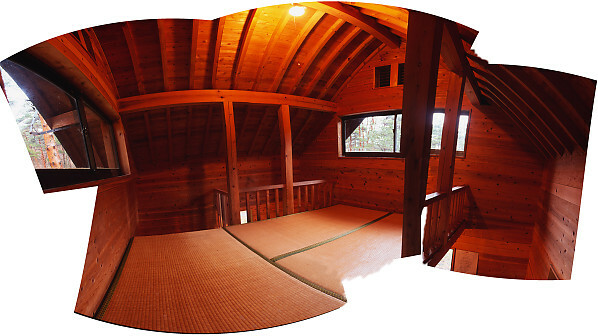 The cabin was solidly build with tatami mats over the wood floors. There was a deep area for taking your shoes/boots off and three levels - a bottom floor where we ate and played cards, a mezzanine that could have sleep 2, but was where we kept out bags, and the top floor where we slept. For the 10,000 yen we spent for the two nights, it was the by far the cheapest accommodations we paid for on the trip. The next morning we woke up in light rain and fog. We had hoped to go for a few hikes, but anything particularly adventuresome was going to buried in fog. While our camp site did have a bath, we decided to try one of the local mountain onsens. Unforuntatly we were greeted with a "No Camera's" sign so I can't show you the amazing view or the milky white river, but needless to say it was a good soak. We weren't going to stay in one of Japan's few national parks without going for at least a little walk. The weather didn't look good (rain came and gone), but we put on a brave face and walked around three volcanic lakes. If the weather had cooperated enough that we could have seen he volcano peaks, this would have been a splendid walk. We met up at the tourist center (mmm, pickles) and then got in the car to get lunch. After lunch we decided to try something a bit more cultural. I've been to a lot of temples in my life so while this is a big complex for the area, it was tiny compared to my memories of Nikko. That said, this temple is very well maintained and set in beautiful surroundings. This temple is known for it's red highlights (and a really big gate). While the gate wasn't particularly photogenic, the red seemed to permeate the place. I don't know who does the painting, but they do a good job. It was nearing the end of the day so we started to head back toward our camp site, hopefully with dinner in there somewhere. We had seen a waterfall on our route to Kirishima-jingu, so we decided to stop in in the last light of the day. I have seen a lot of waterfalls in my life, but this one would definitely be in my top 5. The water going over the falls is hot spring fed so it takes on a creamy blue colour. The water is falling over columnar basalt - a fairly rare rock formation - and each surface is covered with moss or algae that grows under the pressure of falling water. This waterfall was just a few minutes from a combini, but for me was a great highlight of Japanese scenery. It's been a busy day - what better time for another soak! Driving up and down to our camp site we passed the Kirishima Hotel and noticed the huge green house like building connected to the back. We decided to try it out. Gabi braved the front desk and sure enough, they would admit 4 grubby westerners for a bath for just a 1000 yen each. Inside, we found the largest hot spring bath I've ever seen - there were many specialty pools around the central pool and the water was both hot and fresh. In theory, the main pool is mixed bathing, but Gabi was discouraged from entering the pool by an elderly male local. Of course no cameras are allowed, but I will remember that soak for a long time. As nice as the mountains are, it's time for us to go south and to the coast. On the way south we stopped in Chiran - a small town with a few big attractions. The first attraction is a Samurai village - a collection of 7 homes with attached gardens dating from about 200 years ago. The gardens were derived from Kyoto and Tokyo styles by lords who visited the capitals and wanted to bring the sophistication (and maybe a gardener) back with them. The gardens are in a classical geometric forms where ponds represent oceans, rocks represent mountains and shrubs can represent the hillsides. Many of the gardens have specific viewing locations where the garden blends in with the local hills to form a more complete scene. Chiran's other popular attraction is the Peace Musuem for Kamikazi Pilots. During world war 2, 1036 one way missions were flown from the local airbase to American ships off the coast of Japan. This museum has a number of recovered Japanese aircraft (most from harbour bottoms), artifacts and photos from the time period and stories from families. I was quite impressed when we came in - they provided prerecorded translation headsets free to us foreigners - someone was thinkings. The museum was quite somber and gave you a sense of the loyalty and desperation of the time. We had dinner plans in Ibusuki so we had to get moving.